LEWCO Unitized Escapement Device - LEWCO Inc.
LEWCO recently provided an Automotive Integrator with Gravity Flow Conveyor to move machined parts from the machining area to the Assembly area. The completed parts were stored in dunnage and placed on conveyor lines to be stored until they were needed in Assembly. When Assembly is ready for the dunnage they remove one from the lane with an AGV. LEWCO designed an escapement to safely remove one dunnage at a time while holding the rest of the line back. The customer wanted the unitized escapement mechanically linked so there was no way to release more than one dunnage at a time. LEWCO’s unitized escapement is a combination of a roller brake and a claw stop operated by a single air cylinder and controlled by one solenoid operated air valve. This device can be controlled with a hand valve or foot pedal, as well. LEWCO offers a quality product that is cost effective and built to the highest industry standards. 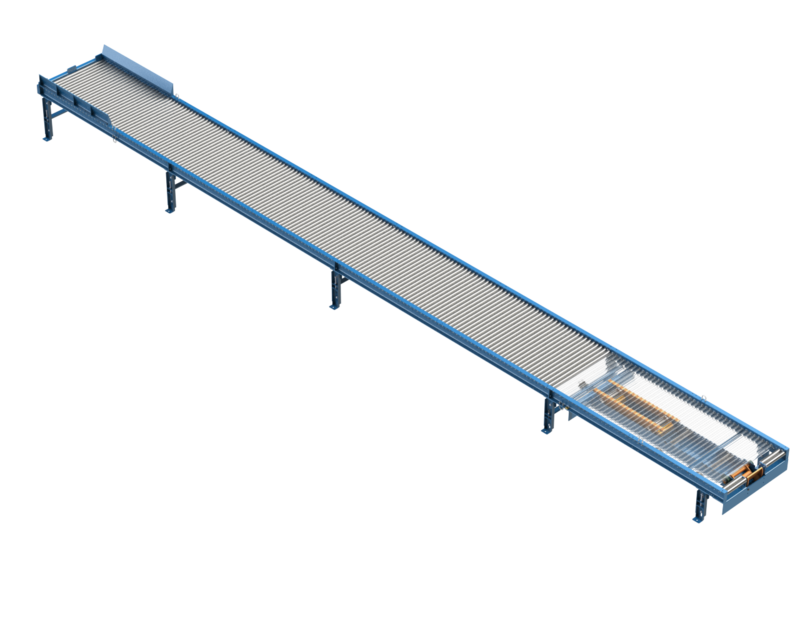 Reduction in manual material handling, improved product flow, better ergonomics and elimination of shipping damage are just some of the benefits of a well-designed LEWCO conveyor system. LEWCO has an extensive amount of experience designing and manufacturing Conveyor Equipment. Our highly knowledgeable staff of Application Engineers can help assess your application and recommend cost effective solutions. You can email your requirements to conveyorsales@lewcoinc.com, call (419) 625-4014 ext.4003, or request a quote on our website.